Virgin America Part 2: Is now the time to solidify its strategy and go public? Virgin America’s breather in growth, underpinned by cutting and deferring some aircraft deliveries, has allowed the nearly seven-year old airline to reach what once seemed unattainable – its first annual profit. The airline’s profitability was supported by consecutive positive net income from 2Q2013 through 4Q2013, and the favourable results have bolstered comments by Virgin America’s executives that the carrier could undertake an initial public offering in 2H2014. It is certainly debatable whether Virgin America’s recent string of profitability is reassuring enough for potential investors; but while the company was making moves to change its financial fortunes Virgin America was also attempting to make other changes to possibly sustain a niche that has been floundering over the past few years. Virgin America’s CY2013 financial results reflect a clear turnaround in the carrier’s fortunes as top-line revenues jumped 7% year-on-year to USD1.4 billion. Its overall expenses grew roughly 1.5% to USD1.3 billion, which resulted in Virgin America recording an operating profit of USD81 million compared to an operating loss of USD32 million the year prior. The carrier reversed a USD145 million loss recorded in CY2012 in CY2013 as profits grew to USD10 million. Two major elements lifted Virgin America’s results during 2013 that may trigger questions from would-be investors over the carrier’s ability to sustain profits without pulling those levers. In early 2013 the carrier reached agreements with investors to eliminate USD250 million in debt and US20 million in interest. At the same time Virgin America closed on USD75 million in debt financing. The balance sheet restructuring allowed the carrier to improve its cash position to USD156 million at YE2013, which was roughly 11% of the carrier’s revenues for the year. Virgin America also cut its order for 30 current-generation Airbus A320s from 10 aircraft, and deferred deliveries of those aircraft and the 30 A320neos it ordered. After a 72% increase in capacity for the two years ending in Sep-2012, Virgin America’s capacity fell 2% in CY2013, and the carrier is not accepting another aircraft delivery until 2015. Virgin America posted encouraging operating results during 2013 as the carrier boasted it recorded the highest year-on-year unit revenue increase of all US major carriers during the year. Its passenger unit revenues increased 9% year-on-year, well-above all the US majors and other hybrid airlines. Among the largest US carriers and ultra low-cost airline Spirit, United’s 3% increase in passenger unit revenues was the highest. Virgin America’s unit revenues were buoyed by a 7% jump in yields and a 4% increase in average fare to USD204.The airline’s 1ppt increase in load factor to 80% was also encouraging, since it was able to sustain loads without compromising yields. Virgin America’s unit costs did jump 3% year-on-year in 2013, largely driven by network changes that resulted in nearly a 7% drop in daily aircraft utilisation to 11 hours per day. But its unit costs excluding fuel of approximately of USD6.8 cents were close to the lowest among the major US carriers. Virgin America has emerged as one of the main beneficiaries of the slot divestitures required by American and US Airways at numerous airports in order to move forward with their merger. It obtained six slot pairs at New York LaGuardia to expand its presence at its third largest base and four pairs at Washington National, allowing Virgin America to grow its footprint in the Washington DC metro area where it serves both Washington National and Dulles. Virgin America operates service to its major bases San Francisco and Los Angeles from Dulles, and to San Francisco from Washington National. The carrier is also vying to obtain two gates at Dallas Love Field that American and US Airways must relinquish in what appears to be a strategy of building a base in north Texas. Virgin America aims to serve Washington National and JFK during 2015 and add flights to Chicago O’Hare in 2015 for a total of 18 daily departures from Southwest’s headquarters. The gate divestiture coincides with the lifting of the Wright Amendment that restricts certain-long-haul flights from Love Field. With roughly six million passengers carried in 2013 and a fleet of approximately 53 Airbus narrowbodies, Virgin America remains a relatively small player in the US airline industry. At times its lack of scale, even in its large markets, has seemed like a challenge for the carrier given its model is based in part on luring passengers away from other airlines with its hybrid product that trends more upscale at reasonable fares. Virgin America still only represents a 9% share in San Francisco, its top base measured by seats deployed, and a 5% share at its second largest base in Los Angeles. 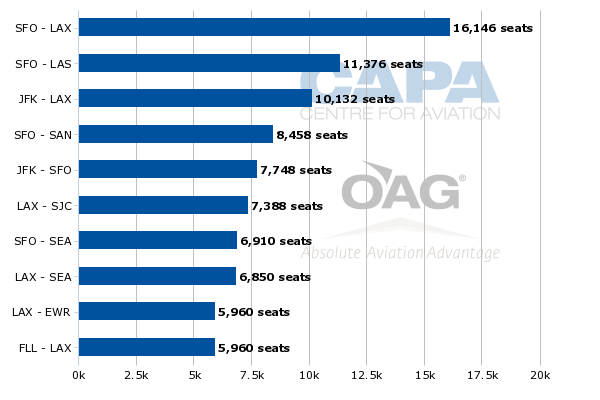 On its top domestic routes measured by seat deployment, Virgin America does not have a commanding share, with the exception of Fort Lauderdale-Los Angeles where it holds a 49% share. There are only two routes where Virgin America has two competitors – Fort Lauderdale-Los Angeles and San Francisco-San Diego. (Based on schedules from CAPA and OAG, American is exiting Los Angeles-Newark at the end of Mar-2014). In all its other top routes Virgin America faces three-to-four competitors, which makes the markets fragmented and competition fierce. But perhaps Virgin America’s latest results show that it has finally reached a point where it can execute its niche. It has proven to be a disruptor for fellow hybrid carrier Alaska Air Group in US west coast markets and created havoc for United Airlines when it launched new service from United’s Newark hub to San Francisco and Los Angeles in Apr-2013. Prior to Spirit Airlines’ initial public offering in 2011 (which registered at a share range that was lower than expected), the ultra low-cost carrier recorded at least three consecutive annual profits. With just a year of profitability underpinned by debt extinguishment and cutting back growth, Virgin America has a tough road ahead of convincing investors of its long-term viability.